It has been an ongoing joint effort amongst lifesaving groups and big wave surfers to develop a sled that is strong yet safe for the users. With our unique foam systems, are at the leading edge of this search. Together with the groups we have developed the Jet Rescue 'Newks' Sled. Made from our unique closed cell foams, and incorporating a soft deck pad and hard skin bottom, the Jet Rescue 'Newks' Sled has the capabilities of being a strong and extremely safe sled. All our foam is heat laminated to avoid delaminating and is fully treated for the harsh beach conditions it will endure. Now fitted with our New Sled Nose Cone the Jet Rescue 'Newks' Sled becomes a hard working, valuable piece of rescue equipment. . The Jet Rescue 'Newks' Sled has 10 handles, with 8 of these being along the sides of the sled and 2 across the nose section. Therefore the Jet Rescue 'Newks' Sled exceeds requirements set by Australian and Hawaiian Rescue Sled Standards. The Jet Rescue 'Newks' Sled will fit all makes and models of PWC and can be optioned with all fittings needed for installation to your craft. The easy to read instructions will have you on the water in no time. Jet Rescue 'Newks' Sleds are fully endorsed rescue sleds for SLSA use.They are recommended by the Australian Professional Ocean Lifeguard Association, Surfing Australia, SEA-DOO, YAMAHA, POLARIS and KAWASAKI watercraft dealer’s Australia wide. We have been working with Life Saving Organisations for the past 19 years in the development of Jet Ski Rescue Equipment. The original Jet Rescue Newks Sled was the only sled to originally be endorsed by the Surf Life Saving Australia. Currently we have seen a couple of other entries come into the market. These new brands are of a great quality; however we at Jet Rescue wish to once again point out why we see our sleds as by far the best around. The Jet Rescue 'Newks' Sled are made from 100% polyethylene foams.Therefore we do not cross link products that are not compatible with each other.This in turn eliminates delamination. Our sleds come with a comfortable soft deck pad and a hardened slick skin on the bottom.This provides both comfort, strength and stability on the craft. The Newks Jet Rescue Sleds will fit all makes and models of PWC. The Newks Jet Rescue Sleds are 100% Australian made and owned. 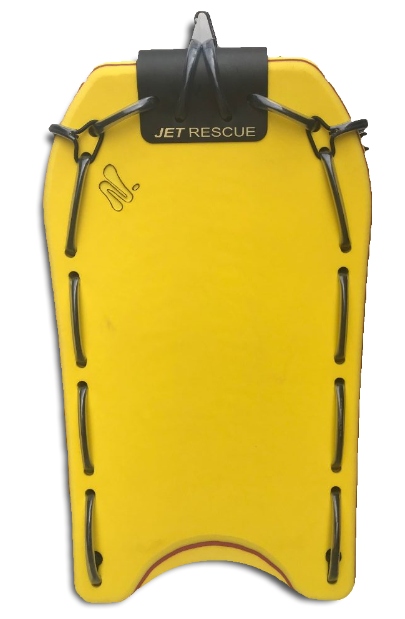 The Jet Rescue 'Newks' Sled is suited for heavy duty use and large surf situations. This is a favourite for Tow-In surfers and Lifeguard and Police Services Worldwide. Jet Rescue 'Newks' SLSA Sled is currently fully endorsed by Surf Life Saving Australia and all the state bodies as well as being recommended by the Australian Professional Ocean Lifeguard Association, all brands of Watercraft manufacturers, and Lifeguarding and Lifesaving organizations around the world.